On October 29, 2015, in Ferguson v. State of Ohio, 2015-Ohio-4499, the 8th District Court of Appeals held R.C. 4123.512(D) is unconstitutional. The court of appeals found that the provision of the statute requiring claimants to obtain an employer’s consent before dismissing an employer initiated appeal violated the Ohio and Federal Constitutions. On December 11, 2015, the State of Ohio filed a jurisdictional appeal and memorandum in support in the Supreme Court. The following amici curae (friends of the court) filed a jurisdictional memorandum: the Ohio Chamber of Commerce, the National Federation of Independent Business/Ohio, the Ohio Self-Insurers Association, the Ohio Council of Retail Merchants, and the Ohio Farm Bureau Federation. On January 11, 2016, the plaintiff filed a memorandum in response to jurisdiction. Under the Ohio Constitution, the Supreme Court has discretionary jurisdiction over cases involving public or great general interest. Generally speaking, cases that have a widespread effect or involve the constitutionality of a statute are of sufficient public or great general interest to invoke the court’s discretionary jurisdiction. Considering the court of appeals’ decision struck down R.C. 4123.512(D) as unconstitutional and there are literally thousands of workers’ compensation appeals filed each year, it seems likely the Supreme Court will accept jurisdiction over the State’s appeal. In State ex rel. Segal v. Elex Inc., 10th Dist. No. 14AP-608, 2015-Ohio-5275, the 10th District Court of Appeals addressed whether the claimant’s failure to re-enter the workforce amounted to a voluntary abandonment of the labor market, precluding temporary total disability (“TTD”) compensation. The claimant sustained a cervical and thoracic injury in 2005. In 2008, after a period of TTD compensation had been paid to the claimant, the Commission determined he had reached maximum medical improvement (“MMI”), thereby terminating compensation. The claimant applied for and began receiving Social Security Disability benefits and took a disability retirement from work because of the conditions underlying his work injury. Thereafter in 2008, the claimant sought work on one occasion, but, never again attempted to re-enter the workforce. In 2011, the claimant filed an application for permanent total disability (“PTD”) compensation. During the processing of the application, a state doctor found the claimant was capable of performing light duty work. The claimant withdrew his PTD application and the Commission never held a hearing on the application. 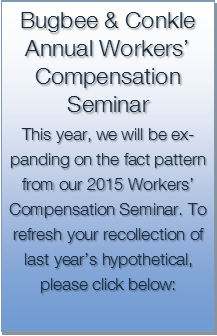 In 2013, the claimant underwent surgery and filed a motion for a new period of TTD compensation. The Commission denied the motion because the claimant abandoned the labor market in 2008. The Commission found the claimant was capable of performing some type of work, but, failed to seek employment. The claimant challenged the Commission order on mandamus, arguing that the Commission abused its discretion by failing to make an initial finding whether the claimant’s departure from his employer was injury induced or not. 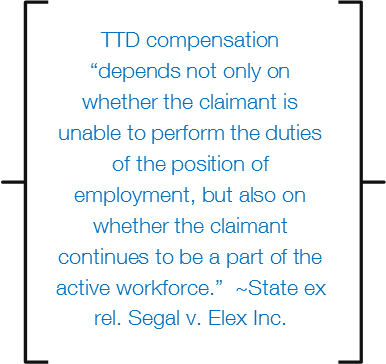 The court of appeals held that eligibility for TTD compensation “depends not only on whether the claimant is unable to perform the duties of the position of employment, but also on whether the claimant continues to be a part of the active workforce.” The court found there was evidence before the Commission showing the claimant was medically capable of performing other work in the years following the initial injury, but, the claimant failed to make a credible attempt to re-enter the workforce. Consequently, there was evidence to support the Commission’s determination. As part of the Commission’s five year rule review, it is proposing amendments to Ohio Admin. 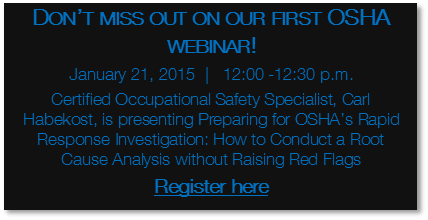 Code 4121-3-16 Motions, 4121-3-22 Inspection of claim files, and 4121-3-30 Emergency Hearings. The proposed amendment to 4121-3-16 removes a requirement that motions contain citations to legal authority. The proposed amendment to 4121-3-22 removes procedural steps addressing in-person inspection of claim files, which are practically obsolete since the Commission has adopted a paperless recordkeeping system. The proposed amendment to 4121-3-30 requires the hearing administrator to contact parties and attempt to find a mutually agreeable date and time for emergency hearings before scheduling such hearings on the docket. Click here for more information on the propose rule changes.